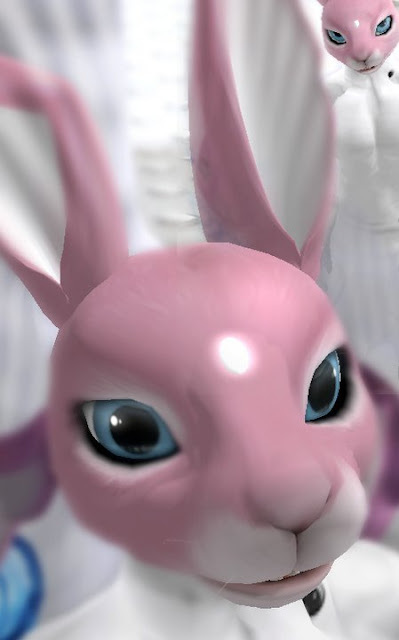 About one year ago i included in my degree thesis “On The Aesthetic Experience In Virtual Worlds" the work of an italian digital artist and creative director, Luca Lisci. About one year after, i’m here to introduce to you all Luca - also known as Voom - and talk with him about his new art project, Voom Hotel. Promoetheus - Machinima by Luca Lisci. Cosmic Gods and ultra-contemporary pop surrealism machinima. Winner of Machinima Award 2009 by Machinima Guild in Second Life. Selected by FILE 2010 Electronic Language International Festival Sao Paolo Brazil. My SL avatar PetraWolf in front of Voom Hotel (March 9th, 2011). Luca, let’s talk about your cultural background. You’re involved in performing media, videomaking machinimas and procedural art. How did you approach to the metaverse world and especially to this kind of art? I’ve spent my younghood keeping my traditional art separated from my geek intentions. It was a bad effort playin’ the hopping game. I could not find anything good enough from the union of two things. I continued to study interface programming at high-school during the day and drawing fiction in the night: my family got a long tradition in paintings, i loved pop art and surrealism. In the years i felt in love with movies. Peter Greenaway’s ‘’Prospero’s Book’’ based over Shakespeare’. The Fellini’s ‘’Casanova’’, and cult like ‘’Barbarella’’ started something, but ‘’Tron’’ was the true blast to me. After high-school i went to university, i studied Architecture and Industrial design: computers grew as i grew. As soon as i got into art direction for advertising and entertainment industry I begun using computer to make images, i liked the idea of ‘performing portraits’, instead of statics, using code to give images a life of their own: as i discovered just later, the two things i could not unite came as one at last. 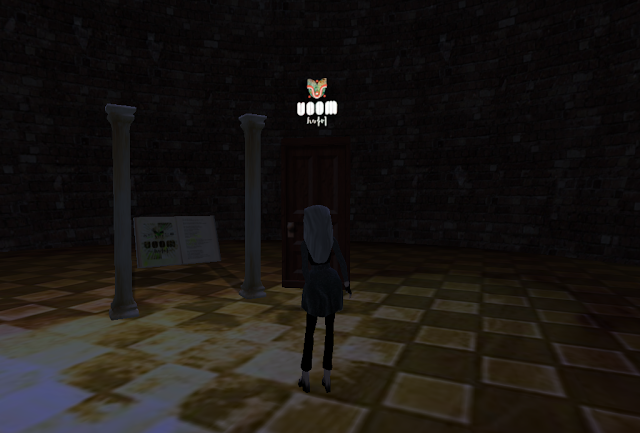 Was in 2006 when i crossed 3D online world like Second Life, it was the begininnig of the story. I came then into virtual art, that means full convergence of all my tools and visions together. Who’s Mr.Voom? Voom’s the bard. It’s the first other self i met. To say it’s the living point of contact i got with me. He’s the totem i focus to when i go exploring other version of reality. He’s my personal Orpheus. 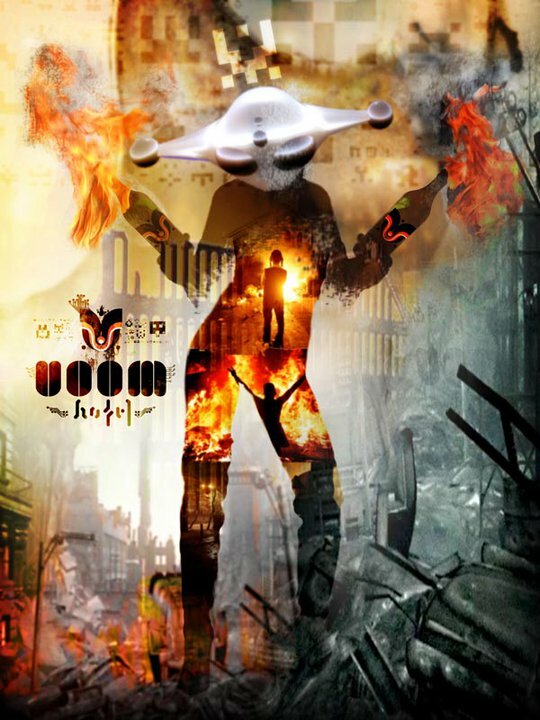 "Voom Hotel is a transmedia art project made of a certain number of linked virtual locations. There are Rooms, Halls, Hallways, Gardens, Facilities distribuited over different media. Every location got its own guest, customers of the Voom Hotel”. What’s the objective of this project? Let me go where my inner selves are. I need to build a representation, i need to get them out to get me free. The Voom Hotel is not built by bricks nor by pixel or bytes, but can be represented by bricks , pixels, bytes as digital image, poetry, video, painting, music. I can use whatever i got in my hands to give it a way to be perceived. I can use computer, metaverses, even performances, theatre, videos, poetry. At how many levels of immersion can you enjoy Voom Hotel? People can enjoy the Voom Hotel the way they like the most. Are you passive? Just grab a seat to follow one of the Voom Hotel’s residents: you can see videos about the stories of Mr. Meta Lexico and Ms. Yizhou Flow, you can follow Twitter to listen ‘the hallways’ rumors. You can even follow the drama of Wing Fallen’s rock music, or share the Facebook company page. Are you interested in taking part? Just ask: Mr. Voom may rent you a room at the hotel. So you have a section on your site dedicated to Guests and Rooms, Leisure Areas and Service Areas: tell us about the structure of Voom Hotel. How did you plan it? Is it an evolving architecture or not? Voom hotel is living architecture since the building is made out of pure imagination. As a living creature it eats, digests and shits, it ages. Every space of it represents a corner of the living mindscape i am. Rooms are extentions of guests: guests are point of convergence of memories, imaginations, sensations. Leisure areas like Zhong’s Tunnel of Love and Icon String’s Hi-Score Park are statements defining the ‘’innatural’’ laws my imaginations is set up with. Service Areas like Lush’s Laundry Hall are zones of my obsessions. Virtual Art Performance. Varios Jugadores shaping a single digital scultura di carne virtuale dans le jardin d'hiver. Is there any reason to experience Voom Hotel? You don’t have to have any reason to experience Voom Hotel. How much interest there’s in real world around transmedia art and how it is expressed? Trans-media storytelling is the way we live today, it’s our perception of reality. Just one plain example: the riots in maghreb are here with you, still you are very far from there. You are into those events by simultaneous feeding among different media streams. Twitter, Facebook, YouTube, Blogs. You have the whole scenario by putting togheter different kind of media, every one giving you a very different way to experience that fact. Tell us about one of the latest initatives by Voom Hotel. 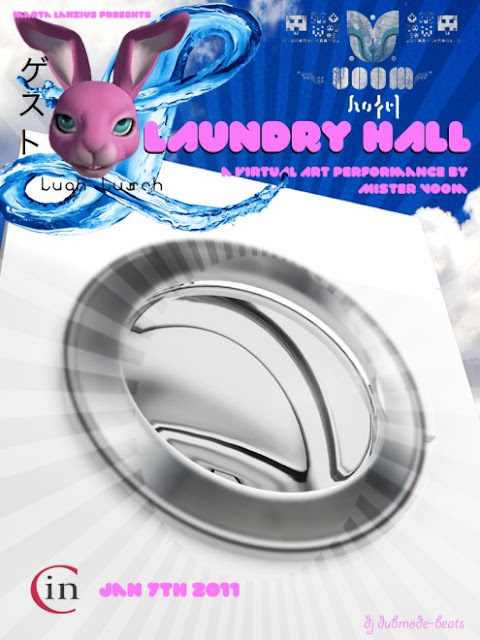 Voom Hotel Laundry hall performed rencently in the Second Life: about 80 people shared their avatars in a huge washing machine. At the end of the washing process they felt really clean, Mr. Luqh Lusch, the chief officer of the laundry services is an anthropomorphic pink rabbit. He’s a bit a maniac but very efficient. The performance has been purchased by the MiC, the museum’s network of the city of Rome. Laundry Hall. A virtual art performance by Mr. Voom. Are your artworks for sale? Yes they are. Voom Hotel is a big resort and very expensive to maintain. So digital frames of guests and events are for sale, but we are almost ready to launch a new line of art products, i’ll tell you. Please also let me mention our primary venue, the room rental. What are you working on right now? Is there any preview for us about Voom Hotel’s project? We are now finally closing the recording session of Wing Fallen’s album: Loud in Silence. As you may know Wing was on trial, accused of multiple murder. He has has been confined in a special section of Voom Hotel, under a rehab program leaded by Mr. Voom. Wing is a rocker, and the project means to renew his sociability through the recovery of his identity as an artist. The process is quite challenging but i think we finally reach our final goal by this spring. You can buy original Voom Hotel artworks via SMARTAREA art gallery.